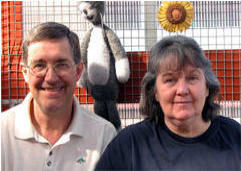 About us We first started animal rescue 30 years ago and have been vegans for the same number of years. Our Shelter operates from our home and we handle a mixture of animals numbering 500-600 per year; and we have a no-kill policy at our Shelter ―unless the quality of life has gone. Our Shelter has been placed first for six awards. Pet Plan/Cats Magazine voted us Best Cat Rescue Shelter in the U.K. five times winner of Luton in Bloom Floral Display (Business Premises) and the High Sheriff of Bedfordshire presented us with the Good Citizenship award for the service we give to senior citizens and the help we give to them with their companion animals with tasks that they are unable to do by themselves. Apart from the animals that are in for re-homing, we have on average, at any one time, 40 to 50 residential infirm animals, mainly cats and dogs. These live the rest of their days at the Shelter, as they are unsuitable for re-homing for various age and health reasons. They live as part of our family at the Shelter. Apart from minor squabbles, there have never been any major problems. Donations, legacies and standing orders are the lifeblood of the Shelter. Resident animals at the Shelter can be sponsored for what ever donation can be afforded, bearing in mind that the sponsored animal chosen, may have a shorter than normal life, having been previously neglected or cruelly treated but while at the Shelter they are cuddled, loved and respected. We hope you enjoy your visit to this site and use the link to follow us on our new facebook venture.